The new initiative is part of the governments ongoing innovation agenda with this program focused on helping the Department of Defence and is being rolled out as part of last years new defence policy “Strong, Secure, Engaged”. 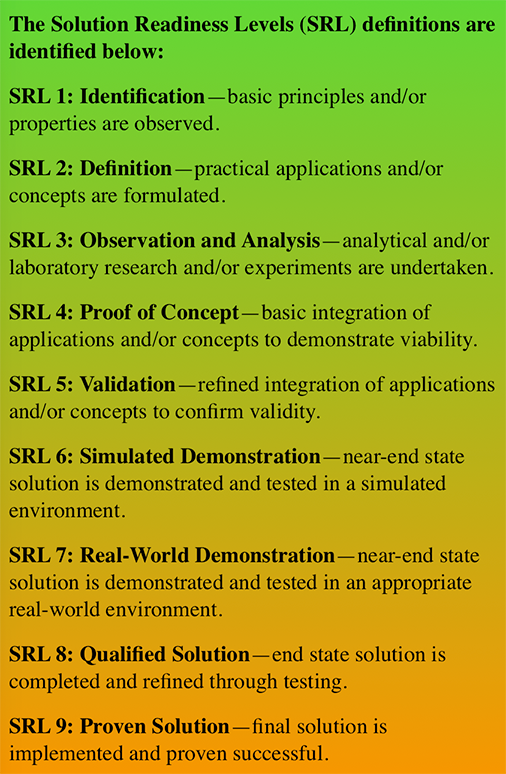 Solution Readiness Levels (SRL) definitions. Credit DND. The announcement is just the first part of a multi-part program spread out over 20 years. 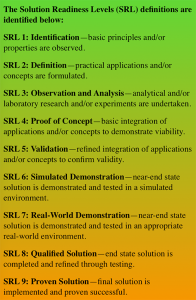 The IDEeS program aims create innovative solutions along a 9 level solution readiness level (SRL) over the course of the program. The first component, 1a, is meant to establish science and technology (S&T) merit, innovativeness and impact. Solutions in this area are meant to fall within SRL’s 1 -6. What is in that Full Motion Video? Infographic – IDEaS Building Defence Capability. Credit: DND. Proposals must be submitted by May 24, 2018 for this round and are capped at $200,000 per proposal. DND will spend up to $50 million on this phase of the program. Winning proposals will have six months to complete the work. DND says contracts are expected to be awarded in the fall. Based on the timeline this would mean Component 1b could start as late as June 2019. Challenge 13) Identification and Characterization of Space Objects – In today’s highly competitive space operations environment, there is a need to improve space situational awareness to ensure a safe and efficient environment for space operations. 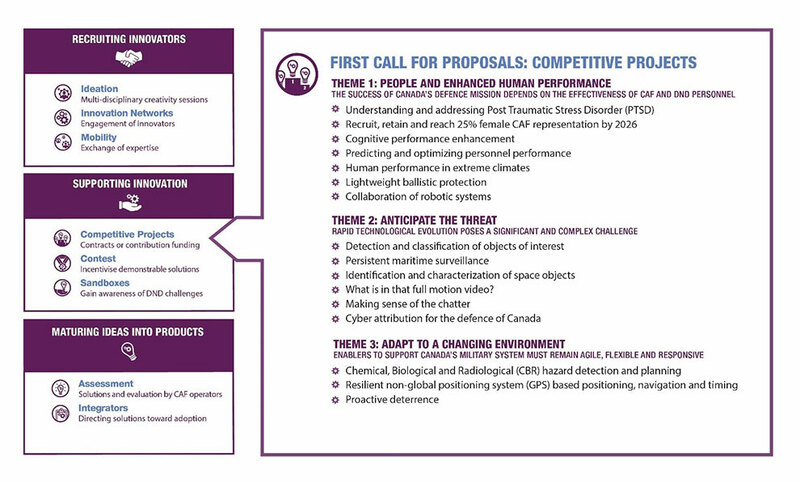 The Department of National Defence (DND) is looking to develop a configurable Common Operating Picture (COP) of space assets that provides the required space situational awareness for informed, expedited decision-making in support of space system operations. Challenge 16) Cyber Attribution for the Defence of Canada – The Department of National Defence (DND) is looking for innovative approaches to access, interpret, and compare all available evidence (e.g. technical, all-source intelligence) on how current cyberspace activities get attributed. This will assist in assessing the current cyberspace environment to improve methods on how to obtain secure cyberspace attribution in a timely manner. Some of the other challenges will have the need of satellites including challenge 11, Collaboration of Robotic Systems. Long Term Vision – Short Term Political Reality? On the surface, the $1.6 billion program appears to be significant. However, the RFP states that “the IDEaS Program is in its infancy and subject to change”. Read what you will into that, but remember that next year is an election year, and if the Liberals don’t get re-elected there’s no guarantee the next government will move forward with the next phases of the program. View the DND IDEeS RFP.